To the southwest of Valencia, bordering on the neighbouring province of Albacete, there is a stretch of fertile land watered by the Júcar, Cautabán and the Reconque rivers. On the banks of these rivers are a series of villages sharing a common geography and a common history. 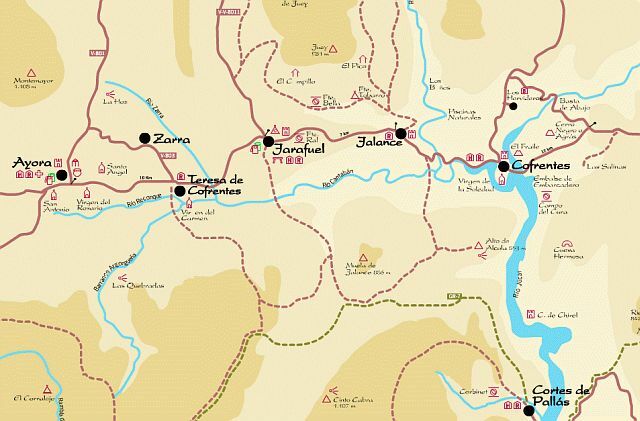 Cofrentes, on the confluence of the Júcar and the Cabriel, is the threshold of this scenic route touring the villages of Jalance, Jarafuel, Teresa de Cofrentes, Zarra and Ayora. Route: From Cofrentes to Ayora, visiting Jalance, Jarafuel, Teresa de Cofrentes and Zarra.